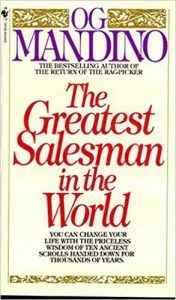 The Greatest Salesman in the World by Og Mandino teaches the readers to become better salesmen through becoming better persons. We all sell in one way or the other. So everyone can benefit from becoming better salespeople. The foundation of any excellent performance begins with the habits you shape (also read The Power of Habits). Sadly, says Mandino, most of us are full of bad habits. And they often start the very first moment we wake up: we snooze the alarm 4 times, then rush to work because we’re late and we’re grumpy and dozing off the whole morning. Your first step will hence be to replace your poor habits with positive ones. Selling is about being good with people and gaining trust. And the best way you can show trust is with love. When you communicate to people from a place of love, they will also warm up towards you. It’s amazing when you do it with people you don’t have a good relationship with, and they will often turn from enemies into friends. Don’t give up. Your next customer, you next call, your next reach can be your sale. If you start stringing failure after failure, stop and regroup before going into the next. And never end the day with a failure. And if you just can’t manage: put everything behind in your night’s sleep and raise up on the next day fresh and invigorated. Do what other successful people do is a common suggestion. The Greatest Salesman in the World proposes instead that you don’t imitate others, but find your own secret sauce for success. Controlling emotions is a key skill for Og Mandino (also read Emotional Intelligence). The Greatest Salesman in the World recommends you keep an even keel without getting too arrogant or too depressed. A great way to change your emotional state, says Mandino, is to stop taking things so seriously. And to laugh at yourself and the world. Procrastination is an ever so seductive muse. And you must destroy her with action. Set up a plan of successive action steps and goals instead and get going right away. Have faith in God above and ask for guidance. The Greatest Salesman in the World is all about mindsets. That means there are no actual sales techniques. The Greatest Salesman in the World is about much more than selling. It’s about self improvement. If the author had shared the concepts in bullet points, The Greatest Salesman in the World wouldn’t have been nearly as successful. This book is a testament to the power of story telling. Teaching with stories is much more powerful because we project our own personality in the story and we’re more open to accept and retain the lessons. I find that teaching the concepts through a fictional story is a great way of teaching. The reader feels closer to the main character, projects his own persona onto him and thus is more open to absorb the books’ lessons. As a last note, The Greatest Salesman in the World is based on Christian beliefs and faith, which might be a pro for some and a con for some others.